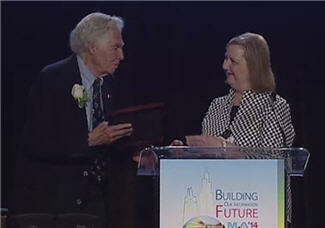 MLA President Dixie Jones, MLS, presents NLM Director Donald A.B. Lindberg, MD with a resolution honoring his 30 years of leadership. NLM Director Donald A.B. 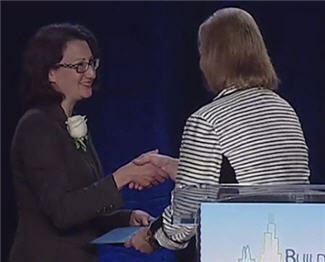 Lindberg, MD, and NLM’s MedlinePlus Connect, received honors at the 2014 Medical Library Association meeting held mid-May in Chicago. Stephanie Dennis, MLS, Head, Health Information Products Unit, accepts the Rogers Award on behalf of the MedlinePlus Connect team. MedlinePlus Connect enables patients and health providers to access consumer health information through electronic health records, patient portals, or other health IT systems. The information comes from NLM’s consumer health Web site, MedlinePlus, which won the Rogers award in 2004. Frank Bradway Rogers, MD was a physician and librarian who directed NLM from 1949 to 1963. MedlinePlus Connect was one of the many resources showcased at the NLM booth in the MLA exhibit hall. The 2014 NLM booth theater presentations are recorded, archived and noted below. This year’s presentations, along with prior year’s and other NLM training material, also can be viewed on NLM’s Distance Education Resources page. June 18, 2014 in Events, People, Programs & Services.